This post is sponsored by iHerb. As always, thank you so much for supporting Eat Spin Run Repeat and the brands I choose to partner with. Spring finally feels like it’s in the air here in Vancouver, albeit much later than usual. Has anyone else been in the mood for spring cleaning lately? I mentioned last week that I’d been clearing some clutter out of my house, and this had the knock-on effect of making me feel mentally lighter. It’s something I find myself doing with the change of every season almost instinctively, and I don’t know about you, but the cleaner my house is, the more grounded and settled I feel. In addition to clearing physical clutter, I also like to think of spring as a great time for renewing healthy habits – everything from daily self-care practices to little nutrition boosters. As coincidence would have it, recently the folks at iHerb reached out to me asking if I’d like to order a few wellness products from their site. With my whole seasonal urge to up-level my daily eats, I had plenty on my wishlist. I’d never ordered anything from iHerb before and had no idea how much was available (over 35,000 products), nor did I realize that they ship to over 160 countries including Canada! I just assumed it was a US-only site, but this was a very pleasant surprise. After paring down my shopping list and placing my order, it arrived on my doorstep in 2 (!!!) days. Many of the prices were lower than in local stores, and I’d 100% do it again. But what did I order? Well, let me tell ya! As you guys know, I’m all about culinary nutrition and making recipes as health-building as possible – all while ensuring they taste delicious too. Upset tummy? 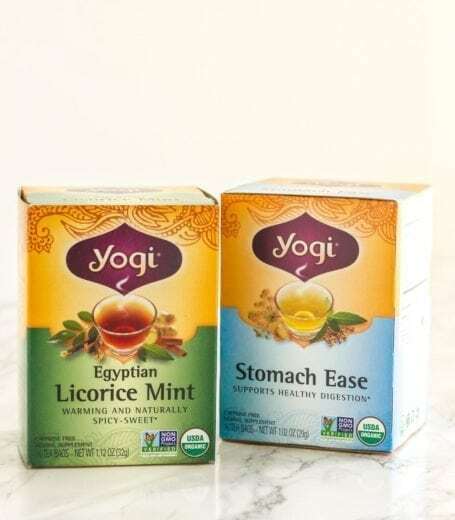 Toss some ginger and peppermint in your tea. Brittle hair and nails? Stir some collagen into your smoothie. Need a quick mood boost? Chocolate is the answer! 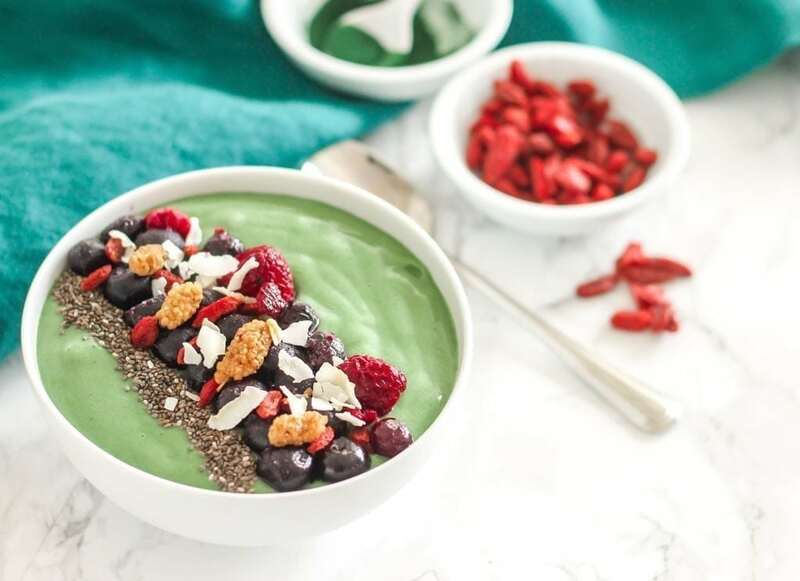 The term ‘superfood’ might be one of the most overused in the nutrition world these days, but all the items I’m about to show you are ones that I consider superfoods. 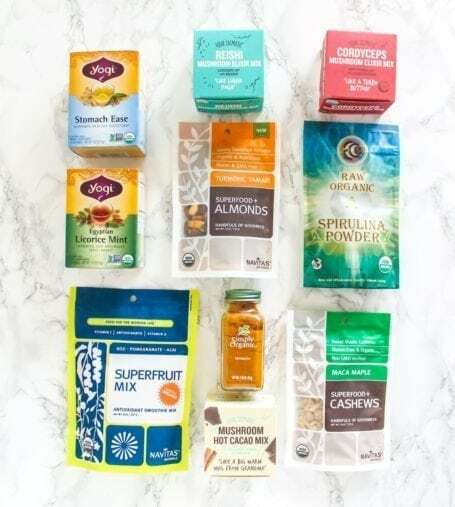 Some can be mixed into recipes whereas others are perfect for carrying around on the go, meaning it’s easy to add these little health boosters no matter how little time you have to spare. Reishi Elixir… helps with winding down and lowering cortisol levels. This is by far the one I go through fastest and one of the last things I do before bed at night is drink a mug of reishi elixir mixed with hot water. Mmmmmm…. Reishi Hot Cacao Mix… has the relaxing benefits of the reishi mushroom, plus organic cacao powder which triggers those feel-good bliss hormones. Think hot chocolate, but ohhhhh so much better! 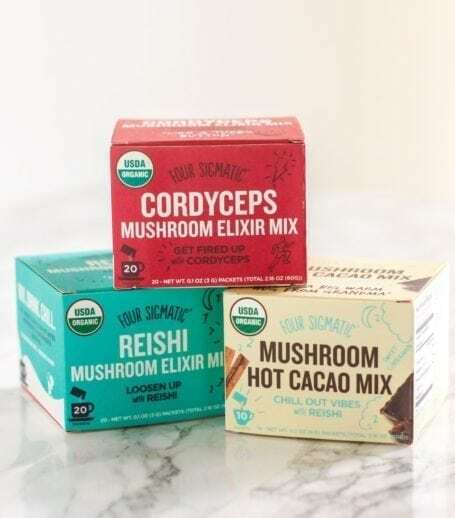 Quality is super important with mushroom elixirs and the reason I love Four Sigmatic so much is because they do it right, meaning they don’t take the shortcuts other manufacturers do. (Fillers such as starches are common in other brands but you won’t find any here, and the product is dual-extracted to preserve all of the nutrients in the shrooms.) All three of these products are vegan, gluten-free organic and caffeine-free. 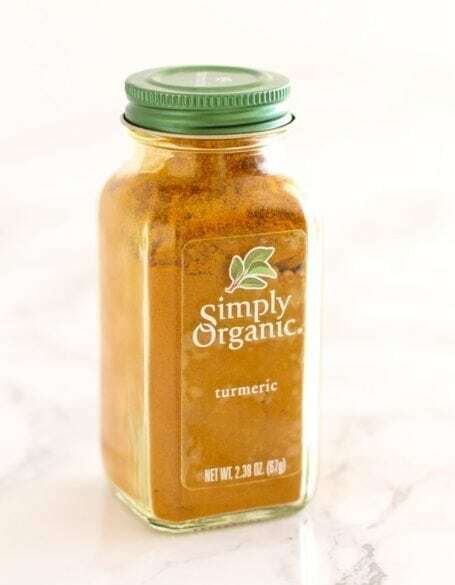 By now you’re probably well aware that turmeric is a rockstar because it’s THE most potent anti-inflammatory food we know of to date, but it wasn’t just made for adding to Indian food. Simply Organic Turmeric is the one I ordered because I love the quality that this brand offers. I use it when making curry powder and Thai seasoning blends (which season all sorts of things, like cauliflower rice and roasted chickpeas), soups, smoothies, and scrambled eggs. It’s got a slightly peppery flavour that helps to make eggs and omelettes more exciting, yet at the same time, isn’t overpowering or detectable in a smoothie. If you were to peek inside my snack stash in my filing cabinet at work, one of the things you’re sure to find is nuts of some sort. (Maybe I shouldn’t have told you – now they might disappear even faster!) If the idea of adding turmeric to the meals you make at home just doesn’t feel convenient, these Superfood+ Almonds with Turmeric + Tamari come with turmeric already dusted on them, and they’ve also got a bit of tamari to add some saltiness. If sweet is more your snack style, the Superfood+ Maca Maple Cashews are definitely something to try (and quite possibly become addicted to!) I talked about them around this time last year when I first discovered them and made my own homemade version, but if you need something quick when a mid-afternoon snack craving hits, these are gold. 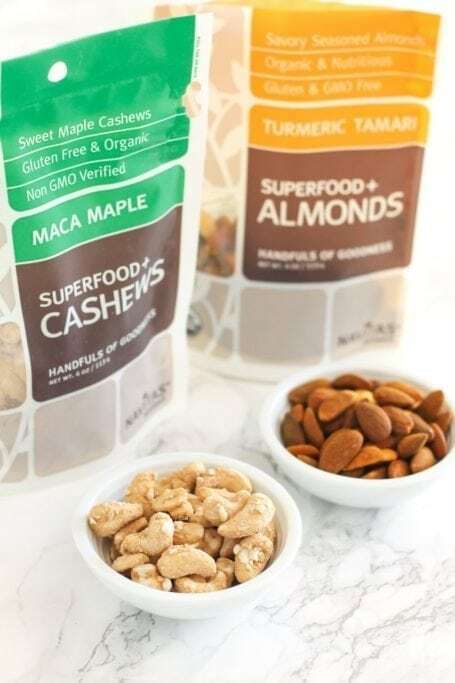 Maca has adaptogenic properties meaning that it can help to balance the adrenals, and also has a gorgeous nutty, caramel-y taste that pairs really well with the light maple coating on the cashews. 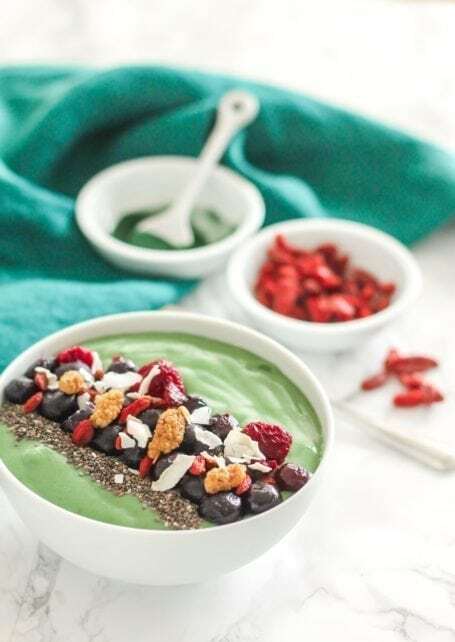 When you think of a smoothie, there are probably a few staple ingredients that come to mind – greens, berries, bananas, maybe some seeds and nuts or nut butters, and some sort of liquid, right? It’s easy to fall into the routine of making the same smoothie day in and out, and while they’re a fantastic example of whole food nutrition, sometimes the thing that makes them most exciting (to me anyway) is the extra little boosts added to shake things up a bit in terms of nutritional diversity. 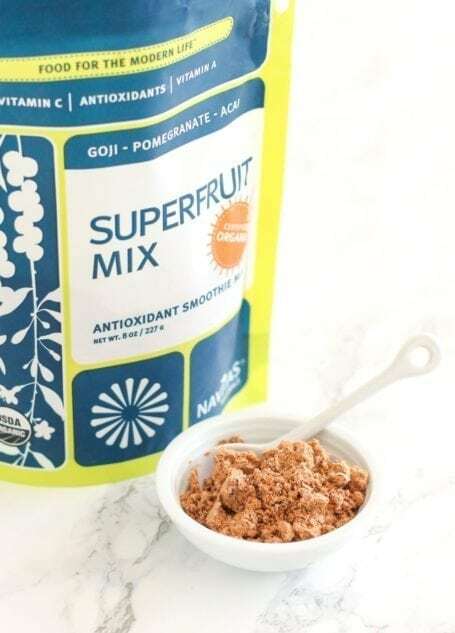 Navitas Organics’ Superfruit Smoothie Mix is a blend of 100% organic and pure goji, açai and pomegranate powders, three very antioxidant-rich fruits that are often found in beauty-boosting recipes and cosmetics. I don’t know about you, but it takes commitment for me to get the arils out of a pomegranate, and while I could toss goji berries and frozen açai packs into my blender, it’s quite convenient to have them in one mixture. (It also travels well, which is a bonus if you’re making smoothies away from home.) The blend adds a touch of natural sweetness and a slightly fruity flavour, making it perfect for smoothies. Since receiving it I’ve also mixed it into plain coconut yogurt with a touch of vanilla for an easy afternoon snack. 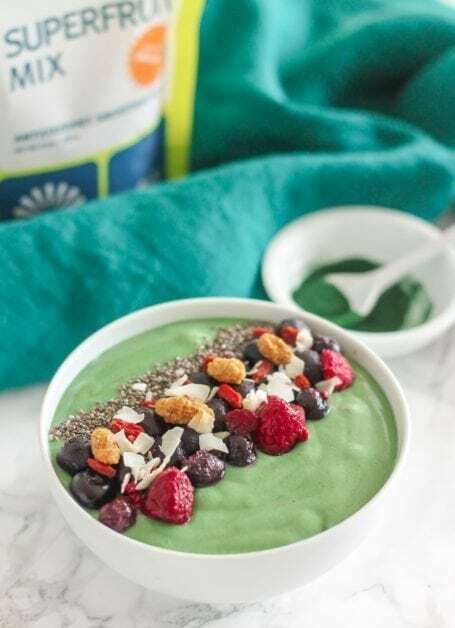 There are many ways to use spirulina such as making homemade crackers, dressings and even face masks, but smoothies are a pretty safe bet if you’re new to it. 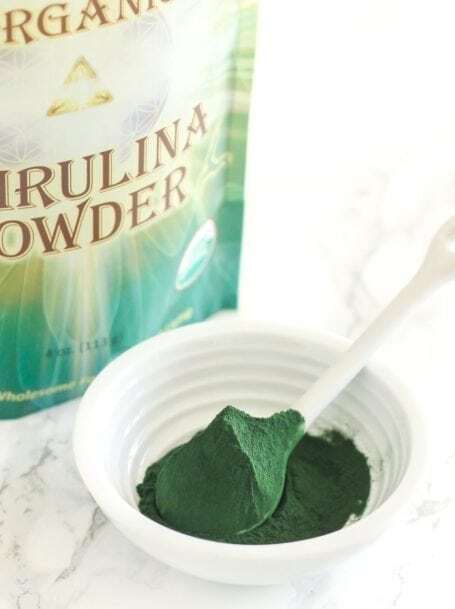 While I don’t have any words of caution for the aforementioned products, know this about spirulina: a little goes a looooong way! You only need ½ – 1 tsp maximum to reap the benefits – and to get a very blue/green blend. Whirl together all ingredients except for the toppings in a blender until a thick, smooth consistency forms. Pour into a bowl and arrange the toppings. Serve with a spoon and enjoy! It’s a Google Trusted Store with a customer service team that provides support in 10 different languages. If you’re a new customer, you can get $5 off your first order by using this link! Note that I’ll get a small commission but every bit goes towards creating the content you guys have been asking me for about health, wellness, nutrition and fitness. Have fun shopping! So tell me… are you making any health or nutrition-related changes in your life this spring? Or, are you also a raving fan of any of the items above?